JUSTIN ACLIN: Get my comic for free at NYCC! Get my comic for free at NYCC! Hey, we’re giving away S.H.O.O.T. 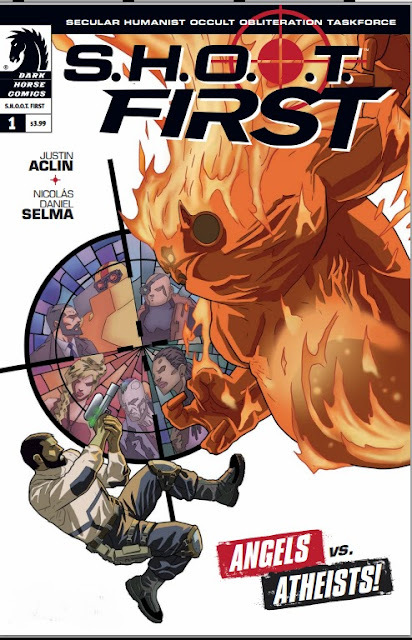 First #1 for free before you can buy it, at New York Comic Con! In celebration of the fact that my co-creator Nicolas Daniel Selma and I are both going to be in attendance at NYCC, Dark Horse has graciously consented to give away a very limited number of copies of our comic, S.H.O.O.T. First #1, for free, only at our signing at the Dark Horse booth, starting at 12 noon on Sunday, October 13th. This is the exact same comic that hits shops on October 16, only it will cost you exactly $3.99 less. It’s not a NYCC-exclusive cover or anything, although I will sign your cover indicating that you were one of the first people to get this at New York Comic Con. S.H.O.O.T. First #1 follows the adventures of the Secular Humanist Occult Obliteration Taskforce as they take on supernatural creatures they don’t believe in. You can read more about the series and check out some preview pages in this interview I did with Comic Book Resources. Both Nico and I are extremely proud and excited to be debuting our creator-owned comic at New York Comic Con, and we can’t wait to share it with you. So come by the Dark Horse booth around noon on Sunday the 13th for free comics! Can’t beat that! Also, if you’d like me to sign any of my Star Wars books, Akaneiro issues or even any Twisted ToyFare Theatre volumes, bring them by as well. I’ll see you there!